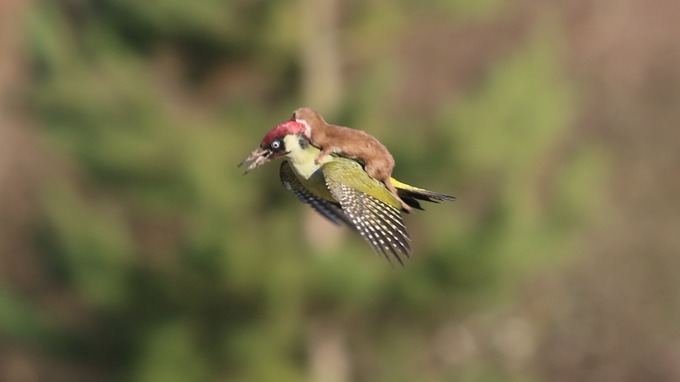 Weasel flying on a Woodpecker?! Have you seen this amazing photograph? 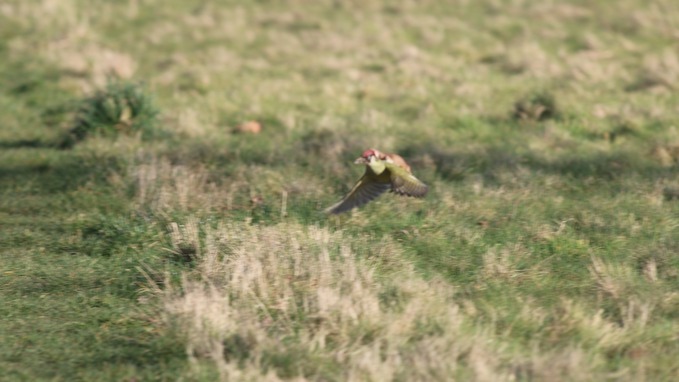 That is a weasel clinging to the back of a green woodpecker in flight! These photos of a weasel attacking a woodpecker were taken in Hornchurch County Park in Essex when the photographer Martin Le-May was out with his wife searching for Green Woodpeckers. They saw a flash of green feathers and heard the bird squawking. Upon further investigation they discovered the bird was in a fight for its life. The weasel attempting to make the bird its meal was lifted into the air on the woodpecker’s back as the bird tried to escape. Miraculously, the bird did escape! This photographer was very lucky to be in the right place at the right time, and the woodpecker is even more lucky to have escaped! Weasels are light weight but fearless predators that usually prey on rabbits. 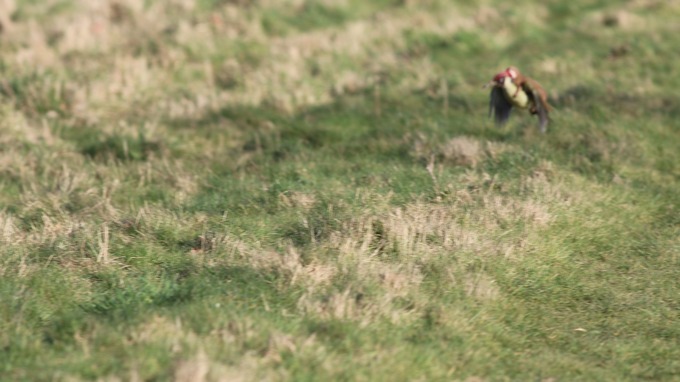 So while the ground feeding Green Woodpecker looked appealing the weasel was a little out of its element. 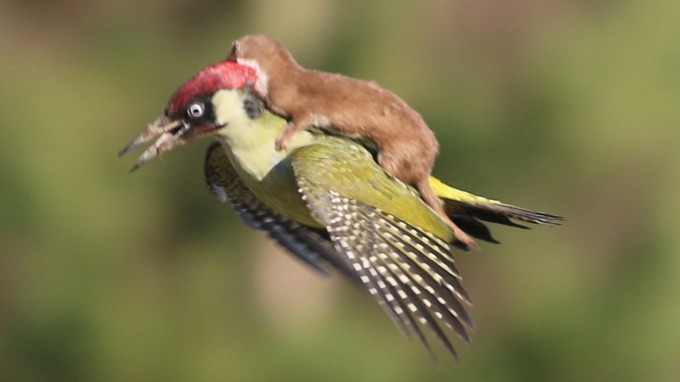 The bird was able to take off and fly with the weasel on its back because of how light they are. It was a sunny afternoon, with the occasional cloud making the Hornchurch Country Park seem that grey brown dull winter colour even though it was the 2nd March. My wife, Ann, and I had gone for a walk. I had hoped that she might see a green woodpecker as she has not really seen one before. As we walked we heard a distressed squawking and I saw that flash of green. So hurriedly I pointed out to Ann the bird and it settled into the grass behind a couple of small silver birch trees. Both of us trained our binoculars and it occurred that the woodpecker was unnaturally hopping about like it was treading on a hot surface. Lots of wing flapping showing that gloriously yellow/white colour interspersed with the flash of red head feathers. Just after I switched from my binoculars to my camera the bird flew across us and slightly in our direction; suddenly it was obvious it had a small mammal on its back and this was a struggle for life. The woodpecker landed in front of us and I feared the worst. I guess though our presence, maybe 25 metres away, momentarily distracted the weasel. The woodpecker seized the opportunity and flew up and away into some bushes away to our left. Quickly the bird gathered its self respect and flew up into the trees and away from our sight. The woodpecker left with its life, the weasel just disappeared into the long grass, hungry. Nature is all around us, you never know what you might find when you start to pay attention!